Liz Davidson founded Financial Finesse, a leading provider of unbiased workplace financial wellness programs, with a mission to give everyone access to financial education. As a pioneer in the unbiased financial wellness movement, she has written a start-to-finish guide on how to achieve total financial wellness for yourself and your family. What Your Financial Advisor Isn’t Telling You: The 10 Essential Truths You Need to Know About Your Money is a practical guide to gain a better understanding of how to best manage your money. The book is a refreshing look at ways to take control of personal finances without being overwhelmed by financial jargon or an occasionally difficult to navigate the financial services industry. Despite the provocative title, Liz Davidson values the advice and guidance of financial advisors who operate in the best interests of their clients. However, as she points out in her book What Your Financial Advisor Isn’t Telling You: The 10 Essential Truths You Need to Know About Your Money each one of us holds the keys to our own financial success. In order to gain a deeper understanding of the book, it is helpful to know the background of its author and the company she founded. Financial Finesse is focused on providing unbiased financial wellness programs to employees or members of organizations who offer services to help them improve their finances. The companies pay for this benefit so the employees or members do not pay anything to receive financial wellness services. Some examples of these financial wellness services include the following: access to phone-based financial coaching, Ask-A-Planner consultations (in-person or virtual), financial planning workshops, webcasts, and an online financial learning center. Despite the growing popularity of financial wellness as an employer-provided benefit, not all employees have access to unbiased financial education. The book provides the opportunity to reach people who currently don't have access to these potentially life-changing financial wellness services through their employer. It is no surprise that the founder and CEO of a leading financial education company would want to spread the message of financial wellness to a broader audience. What is inspirational about the book is that it empowers people to seek change in their financial lives rather than simply enabling people to assume that working with a professional financial advisor is the only path to true financial independence. 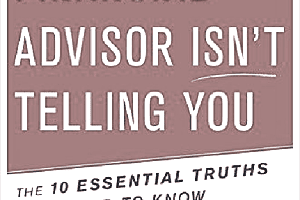 What Your Financial Advisor Isn’t Telling You has an attention-grabbing title but the book was not written as an expose of the inherent problems related to how financial advice is delivered in our country. Instead, the book helps to break down important personal financial planning concepts in an easily accessible manner. What Your Financial Advisors Isn’t Telling You emphasizes the utilization of benefits at work. Your employer has the potential to be a helpful partner when selecting various financial services. Unfortunately, these valuable employer-provided resources are often overlooked and underutilized in many financial planning situations. The book discusses how to incorporate employer-provided financial benefits into a personal financial plan. Retirement plan investment options, matching 401(k) contributions, free legal services, health insurance, and flexible spending arrangements are just some of the most convenient financial resources that are discussed. An easy to understand chart provides a helpful overview of how these benefits work and the estimated value of various employer-provided benefits. Another extremely helpful item in this book is a checklist to help people create a path to become debt-free and financially independent. Prioritizing financial decisions can be a big challenge and the book helps address which financial priorities should garner your attention and focus. The book also contains helpful tools and resources to achieve the best results while managing your money. From the Debt Blaster calculator to the Retirement Plan Estimator there are lots of useful online calculators and resources to help improve your financial confidence and decrease financial stress. Liz Davidson also discusses the best ways to pay off debt, how to choose mutual funds, how to identify the hidden cost of taxes, and how to work together with your life partner. How do financial advisors fit into the picture of achieving true financial wellness? Most financial advisors are honest, ethical and committed to helping guide you toward important financial life goals. The financial media often highlights the bad apples in the bunch. But just like every important profession hearing negative stories can make us protective with whom we trust to help manage our finances. What Your Financial Advisor Isn’t Telling You helps identify where to find a trusted advisor and provides an overview of important questions to ask. This is helpful when working with an existing advisor and also when interviewing someone to help provide guidance. Another helpful set of tools and resources available to readers is the Financial Independence Day site that was created to accompany the book. The “Financial Independence Day” concept is a day that is set aside specifically to get your financial life in order. Readers are encouraged to continue their progress and complete a Financial Independence Day checklist. The Financial Independence Day website also provides guidance for readers to create their own groups to work through the chapters in the book with their friends and family. If you are searching for straightforward financial guidance without a hidden agenda you need to take a look at What Your Financial Advisor Isn’t Telling You. This book will help empower you to take ownership of important financial decisions without beating you over the head with unnecessary financial jargon or overly complex strategies. Most importantly, the content helps readers improve their sense of financial wellness.